The Aston Martin Cygnet is a concept car made by Aston Martin with a joint venture with Toyota in response to tougher emission standards in Europe. The Cygnet is based on the iQ with an emphasis on luxury. 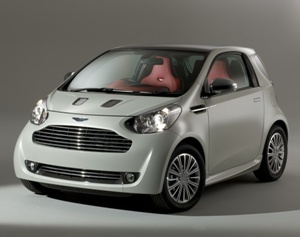 See Wikicars' comprehensive Aston Martin Cygnet Concept Review. Many people dislike this car,as they believe that it ruins Aston Martin's image of making expensive grand tourer sportscars. This page was last edited on 21 October 2010, at 20:02.